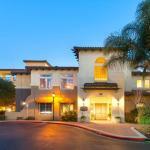 Offering an outdoor pool gardens and a picnic area Bluebird Suites in Santa Clara is located 10 minutesâ?? drive from Mineta San Jose Airport. Free WiFi is available throughout the property. Each air-conditioned accommodation at Bluebird Suites includes a fully equipped kitchen complete with a dining area kitchenware and a refrigerator. A flat-screen TV a seating area and a work desk are featured in each unit. Free secure parking is available to guests. The San Jose Convention Center is 12 km away from the property. Santa Clara University is 12 minutesâ?? drive away.